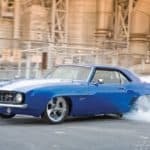 This episode of “Clash of the Classics” pits two heavyweights together, 1969 Mach 1 vs 1969 Z28. Arguably, the greatest battle that has ever emerged in the automotive world is the battle between the Mustang and the Camaro. To be more specific, the 1969 Mach 1 Mustang and the 1969 Z28 Camaro and no two cars have ever evoked more opinion, more disagreements or more races than these two classic giants. The Mustang loyalist swears the Chevy Camaro was the greatest lie ever perpetrated on the motoring public, many will claim the suspension was sub-standard and the the car was General Motors weak attempt to unseat the true King of the Road, contending that the Camaro isn’t worthy to be compared to the ‘All Mighty Stang’. The Camaro fan contends the Mustang is all hype and will always be 2nd place in the Pony Car world citing the fact that FORD spelled backwards is “Driver Returns On Foot”. The debate and arguments have raged on for over 40 years and there appears to be no letup in sight. The Mustang was no slouch, as the Chevy crowd would like us to believe. 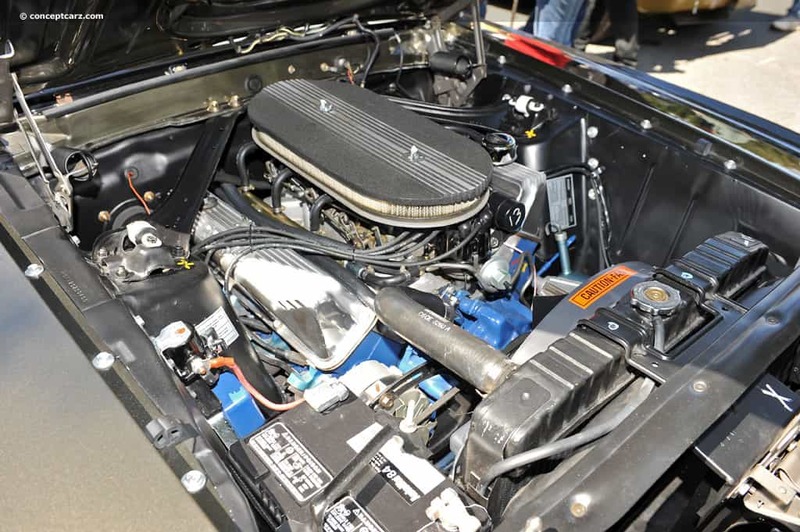 The Boss 429 made 375 horsepower and ran exceptionally well. Handling was the main strength of the Boss 302, which was created to race Chevrolet’s Z/28 Camaro on SCCA Trans Am courses. The weight distribution was good enough to allow for nimble handling and the Ford manual transmissions as well as the stout C6 automatic was outstanding. The styling proved to be timeless (just as Iacocca had predicted) and the first generation Mustang was an overwhelming success. 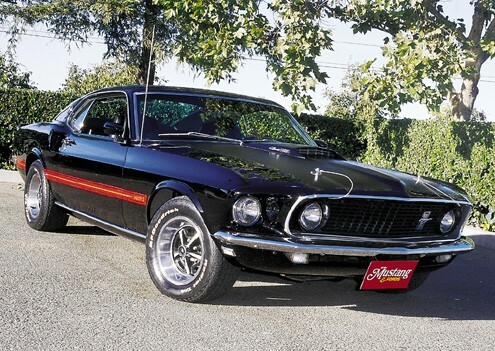 Mach 1s were produced with upgraded suspensions and varied slightly depending upon which engine and transmission the car had. Mach 1’s with big block had front shock tower reinforcement, thicker sway bars and heavier springs. The 428 CJ and SCJ 4 speed cars also came with staggered rear shocks. One cool feature for the Mach 1 was an aggressive looking hood scoop that had integrated turn-signal lights mounted into it. Ford continued to produce the Mach 1 into 1970 with very little change other than cosmetic. The side air scoops behind the doors were eliminated, the seats were revised and new badging and striping were the main differences. For 1970, the 351W was replaced with a new 351C, the updated engine had poly-angle combustion chambers with canted valves and either a 2 barrel or 4 barrel carburetor was available. The ’69 Z28 was both awesome and timeless, it is the ambassador year for the line and inspired even the newest Camaros. The limited edition model with the factory equipped Big Block 427 cranked out 430 horsepower and not only is heavily sought after today, it is one of the most valuable editions on the road. The M22 Rock Crusher Muncie 4 speed is an icon still today and the Turbo 350 automatic is equally durable. The Z/28 was for the road racing fan. Dual exhausts, special suspension, heavy-duty radiator, quick-ratio steering, and 15×7 inch rally wheels. The 302 cid small block was still an option in 69, the transmission was a Muncie four-speed and the differential was a 12-bolt rear axle with standard 3.73 gears. The 302 had 11:1 compression, forged pistons with a forged steel crankshaft, solid lifters, and Holley carburetor. It’s possible and even probable that this argument may never be settled but one thing is certain, it’s a lot of fun driving each, trying to figure which one you like better. 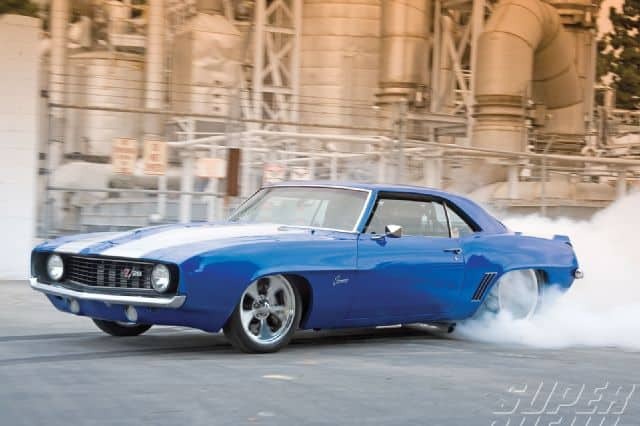 The blue 1969 Camaro seen featured in this post belongs to our long time friend Jim Bassett, it very well may be the coolest Camaro on the planet. Check him out at Bones Fab Hot Rods and Muscle Cars in Camarillo Ca. I’m a Ford guy but this Camaro that Jim Bassett, owner of Bones Fab and a customer and old friend of mine. Built is bada$$. The Camaro is my favorite. I have a 2013 Camaro and I love driving it!